SampleSumo's Melody Transcription (MeloTranscript) library, is a technology package for offline monophonic melody transcription. Basically, what this technology does is the following: you give it a sound recording with a vocal melody, and MeloTranscript gives you back a sequence of notes, with a start time, end time, average pitch, and amplitude for each detected note in the sound recording. 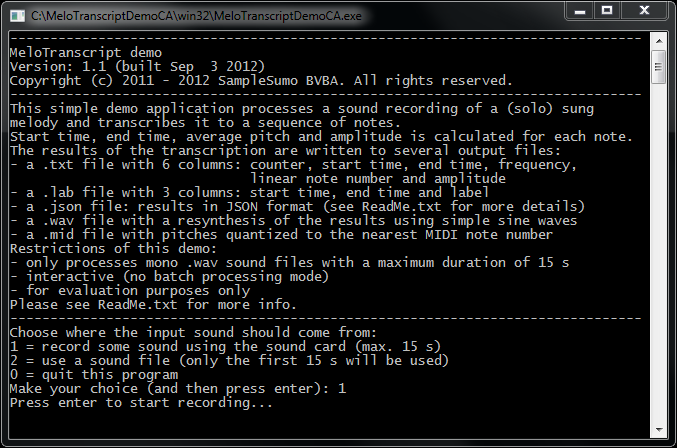 In short: it gives you the notes you just sang or hummed. Note that It was mainly built for use with vocal melodies (singing, humming, singing with dadada, fafafa, etc...). With other monophonic material (flute, clarinet, trumpet, …), your miles may vary. This technology is based on an research carried out at Ghent University. More information in the references section below. MeloTranscript is available as a C/C++ library with documentation, development guide and example code. We currently support Windows, MacOSX and iOS (other platforms available upon request). Contact us for more details, pricing info or an evaluation license to get started. If you would like to evaluate the technology yourself, you can DOWNLOAD our simple technical demo application for Windows and MacOSX.